Every match could have huge connotations on the outcome of our season. With six league matches remaining and only one point separating us from third place in the table and two points separating us from sixth, every match could have huge connotations on the outcome of our season. We host West Ham United at home On Monday night as we continue our quest to return to Europe’s premier club competition. Arsenal and the top two sides in the table so far have only bettered our return of thirty-five points from sixteen home matches. Having lost four of our last six away league matches it is vital that we continue to take maximum points at home. 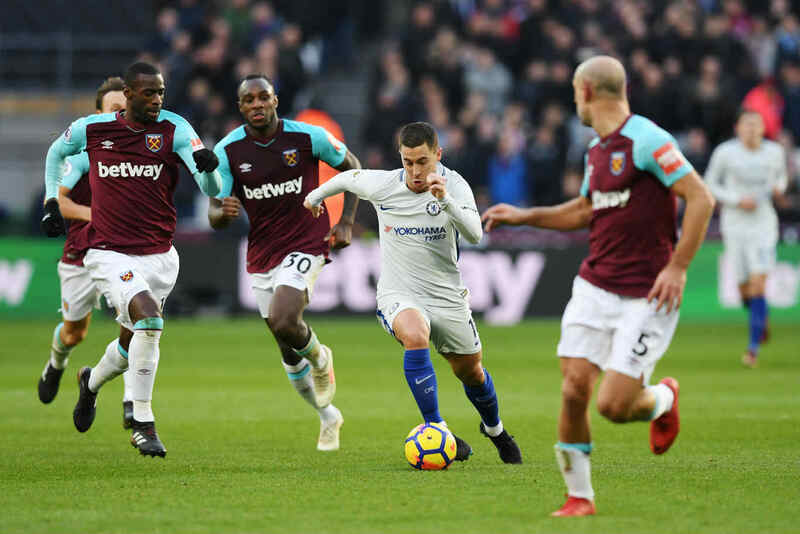 In the premier league era our head to head results against West Ham are good, having won twenty-four and drawn nine out of forty five matches. The overall head to head is a lot tighter though. In all competitions there have been forty-nine Chelsea wins, twenty-two draws, and forty West Ham wins. Our last home defeat against West Ham was in 2002 when Di Canio scored from long range in a 2-3 win for the away side. Since that match we have played thirteen matches at Stamford Bridge against the East London side, winning nine and drawing four. Those four draws have been in the last ten home meetings against them though, and the last two matches between the sides have both been tied. 0-0 away at the London stadium earlier this season, and 1-1 in the last meeting at Stamford Bridge. Our recent record against West Ham isn’t that brilliant, with only two wins recorded in the last eight matches. This is largely based on our poor away record against them though, as five of the last eight fixtures played have been away from Stamford Bridge. West Ham have taken a point from three of the last five meetings at the Bridge though. The visitors will be looking to bounce back after a woeful showing in the home defeat against Everton. Chelsea on the other hand recorded a much needed 3-0 home win over Brighton last time out. That win included Loftus-Cheek and Hudson-Odoi in the starting line up, as well as Christensen and Emerson. Will Sarri be tempted to retain any of these four after shaking up the side had the desired impact? We continue to dominate possession in most matches, but often don’t take our chances when on top, or struggle to create if the opposition are well organised defensively with bodies behind the ball. A worrying propensity to leak goals early in the second half, particularly from set pieces has also started to show. This has put us on the back foot and played into the hands of the opposition. Striking early when on top is key, but something that we haven’t done enough. Of our thirty-two league matches this season so far, we have gone in at the break level in fifteen of them. At home, we’ve only lead at the break in half of our matches. An early goal in this fixture may dent the visitors confidence after their last performance, so it would be beneficial to turn this stat around. West Ham are eleventh in the table but could still feasibly get seventh spot, to which they have a five point gap currently. They average a point a game away from home this season. They have however only won four times on the road in the league. Expect a reaction of sorts from the visitors in a London derby that has always had spice. This will be a tight affair as the last two meetings have shown. With trips to Anfield and Old Trafford coming up, we must maximise home points if we are to get a top four position.